This subproject deals with different types of requirements specifications, which enable the successful search, composition and analysis of services. In the first phase (until June 30, 2015), the focus was on the development of a specification language for services in order to automatically, accurately, and efficiently process them. In the second phase (until June 30, 2019), user-friendly requirements specifications are introduced. These specifications are intuitively understandable and mainly used by the customers (i.e., end users, domain experts) on the OTF market. Whereas this subproject has focused on customers with technical background until June 2015, user-friendly service specifications, which are applicable for everyone and in an advanced version for domain experts, are investigated in the second phase. On the one hand, natural-language specifications provided by the end users are processed. These specifications are inspired by (English) textual descriptions of Apps on service markets like, e.g., Google Play. Therefore, possibly underspecified requirements of the end user are automatically analyzed (i.e., identified, extracted, classified, and formalized), in order to compensate for ambiguity, vagueness, and incompleteness in the given service specifications. On the other hand, the “In-House OTF Market” should be covered likewise; by domain experts who can model their requirements in companies in the form of examples, which are then synthesized into a comprehensive specification. 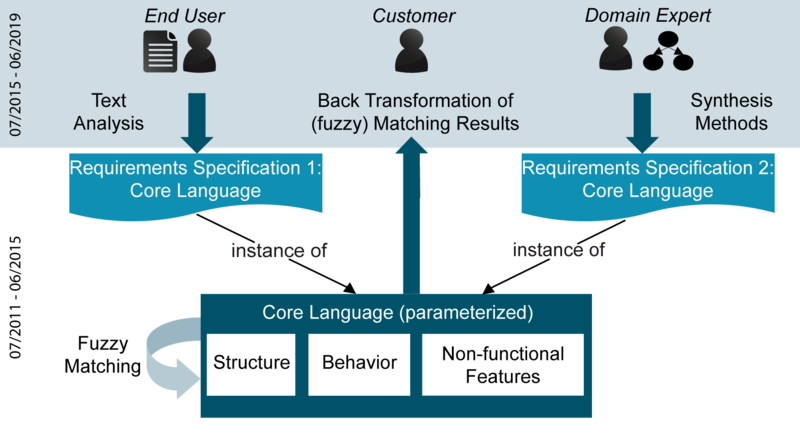 For this purpose, this synthetizing task is translated into an optimization problem, which can resolve existing inconsistencies as well as the (fuzzy) matching of service specifications established in the first phase. Both types of specifications should therefore be translated into the already established ("core") service specification language in order to continue using the defined matching approaches. Furthermore, detailed matching results for the customer are not only important for interpreting the matching results but also, if necessary, for adapting and refining one's requirements specifications if the matching result is not satisfying. As the matching results are only available in the core language up to now, they have to be translated back into a user-friendly format which is comprehensible for the above described customers.